Woven Terry towel with vertical polyester stripes Can be embroidered. Colours: Beige | Grey | Navy. Sizes: 86x170cm. Microfibre Sports towel with pocket and zip. 40x50cm. Can be embroidered. Sizes: 40x50cm. Printed velour beach towel with pocket and zip Can be embroidered or printed. Colours: ROYAL. Sizes: 86x160cm. 378gsm 100% cotton terry velour. Small beach towel ideal for charity and team events. Coastal Blue, Lime Green, Red, Pink, Black, White. Product Size: 609x1066 mm. Print/Embroidery. Size: 457x914 mm. 278gsm 100% cotton terry velour. Hemmed promotional beach towel. Available in white only. White. Product Size: 736x1473 mm. Print. Size: 584x1270 mm. 340gsm 100% cotton terry velour. Twill hemmed velour beach towel. Available in white only. White. Product Size: 762x1524 mm. Print/Embroidery. Size: 584x1270 mm. 340gsm 100% cotton terry velour. Twill hemmed velour beach towel. Available in various colours. Navy Blue, Royal Blue, Coastal Blue, Hunter Green, Lime Green, Apple, Purple, Red, Pink, Orange, Gold, Lemon, Black. Product Size: 762x1524 mm. Print/Embroidery. Size: 584x1270 mm. 290gsm 100% cotton triple sheared terry velour. Promo weight velour towel. Hemmed and sheared for nap softness. WHITE, AQUA, LIME, ROYAL, YELLOW. Product Size: 1473Wx711H mm. Print/Embroidery. Print Size: 1200Wx580H mm. 360gsm 100% cotton triple sheared terry velour. Bright beach colours offered in a soft velour finish. Hemmed and sheared for a plush feel. Excellent print registration. BLACK, WHITE, AQUA, BEIGE, BURGUNDY, CHOCOLATE, HOT PINK, KELLY GREEN, LAVENDER, LIGHT PINK, LIME, NAVY, ORANGE, PURPLE, RED, ROYAL, SILVER, SKY BLUE, YELLOW. Product Size: 1524Wx762H mm. Print/Embroidery. Print Size: 1200Wx600H mm. 490gsm 100% cotton loop terry. 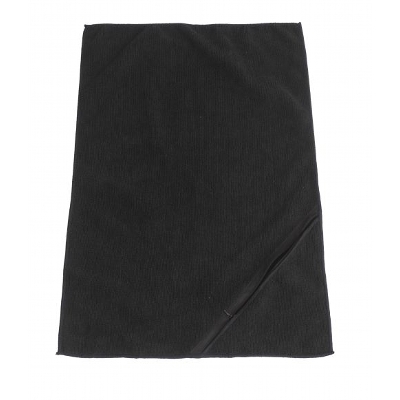 A most luxurious loop terry towel with decorative border and hem finish. This oversized beach towel is offered in a rainbow of colours. ROYAL, YELLOW, RED, PURPLE, ORANGE, NAVY, LIME, LAVENDER, KELLY GREEN, HUNTER, HOT PINK, CHOCOLATE, BURGUNDY, BLACK, BEIGE, AQUA, WHITE. Product Size: 1651x889 mm. Print/Embroidery. Print Size: 1150Wx660H mm. 520gsm 100% cotton yarn dyed terry velour. Custom jacquard towel features your design woven directly into the entire towel using up to three colours and sculpturing for embossed look. Towels can be personalised with recipient's name. AQUA 3125, BLACK, BRONZE 730, BURGUNDY 209, CHAMPAGNE 466, COPPER 1525, CREAM 4545, CURRANT 195, DARK GREEN 3435, DARK LIME 362, DARK ORANGE 167, DARK RED 202, EARTH 451, EGGPLANT 2767, ESPRESSO 411, FRENCH BLUE 285, GARNET 187, GOLD 123, HUNTER GREEN 357, KELLY GREEN 3298, LIGHT BLUE 283, LIGHT LIME 375, LIGHT ORANGE 1575, LIGHT PINK 203, LIGHT PURPLE 265, NAVY BLUE 289, NEW GOLD 1245, OCEAN BLUE 304, OLD GOLD 143, ORANGE 21, PINK 238, PRAIRIE GREEN 577, PROCESS BLUE 3005, PURPLE 266, RED 185, ROYAL BLUE 287, RUSTY 1535, SCOUR, SILVER 427, SLATE 648, SOFT PINK 1895, TAN 465, TAUPE 1545, TEAL 325, WHITE, YELLOW 12, SAMPLE (RANDOM COLOUR ONLY AVAILABLE). Product Size: 1524x864 mm. Jacquard. Size: 1524x864 mm. 580gsm 100% cotton yarn dyed loop terry. Custom jacquard towel features your design woven directly into the entire towel using up to three colours and sculpturing for embossed look. Towels can be personalised with recipient's name. PROCESS BLUE 3005, WHITE, AQUA 3125, BLACK, BRONZE 730, BURGUNDY 209, CHAMPAGNE 466, COPPER 1525, CREAM 4545, DARK GREEN 3435, DARK LIME 362, DARK ORANGE 167, DARK RED 202, EARTH 451, ESPRESSO 411, FRENCH BLUE 285, GARNET 187, GOLD 123, HUNTER GREEN 357, KELLY GREEN 3298, LIGHT BLUE 283, LIGHT LIME 375, LIGHT ORANGE 1575, LIGHT PINK 203, LIGHT PURPLE 265, NAVY BLUE 289, NEW GOLD 1245, OCEAN BLUE 304, OLD GOLD 143, ORANGE 21, PINK 238, PURPLE 266, RED 185, ROYAL BLUE 287, RUSTY 1535, SILVER 427, SLATE 648, SOFT PINK 1895, TAN 465, TAUPE 1545, TEAL 325, YELLOW 12, CURRANT 195, EGGPLANT 2767, PRAIRIE GREEN 577, SCOUR, SAMPLE (RANDOM COLOUR ONLY AVAILABLE). Product Size: 1524x864 mm. Jacquard. Size: 1524x864 mm. 360gsm 100% cotton yarn dyed cotton loop terry. 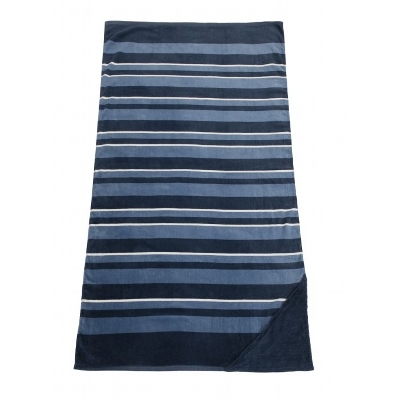 When embroidered, these classic cabana 5cm striped beach towel will elegantly deliver your message. ROYAL, LIME, RED, YELLOW. Product Size: 1524x762 mm. Embroidery. 240gsm 100% microfibre polyester velour. Ultra soft absorbent beach towel. Water absorbent and quick drying. Compact size when folded makes it great for travel. Edge to edge sublimation printing with full colour photo process. SUBLIMATION. Product Size: 1524Wx762H mm. Sublimation. Size: 1524x762 mm (Sublimation). 270gsm 60% cotton 40% microfibre polyester terry. This soft and absorbent cotton loop terry beach towel reverses to an ultra-smooth microfibre optimised for sublimation printing. The promotional possibilities of this towel are limitless. Make a statement in full colour with edge to edge photo process printing in stunning detail and vibrant colours. SUBLIMATION. Product Size: 1524Wx762H mm. Sublimation. Size: 1524Wx762H mm (Sublimation). Description: Soft, super fluffy coral microfleece provides a luxurious look and feel to this blanket - it also keeps you warm!. . Size: 127cm W x 150cm H. Colours: Black | Navy | Silver. Decoration Areas: Embroidery | Supaetch Bags | Supasub Fleece. 325gsm 100% cotton terry velour. Hemmed lightweight golf towel. Trifold grommet and hook. White, Orange, Gray, Red, Navy, Royal, Hunter Green, Black. Product Size: 381x609 mm. Print/Embroidery. Size: 304x406 mm. 280gsm 100% cotton terry velour. Hemmed soft touch golf towel. Corner grommet and hook. Navy Blue, Royal Blue, Carolina Blue, Hunter Green, Kelly Green, Purple, Burgundy, Red, Pink, Texas Orange, Orange, Gold, Vegas Gold, Black, Gray, White. Product Size: 381x457 mm. Print/Embroidery. Size: 279x355 mm. 490gsm 100% cotton triple sheared terry velour. Heavy weight with dobby hem. Trifold hook and grommet. WHITE, BURGUNDY, LAVENDER, NAVY BLUE , ROYAL BLUE , SILVER, ORANGE, LIGHT BLUE, GOLD, AQUA, BEIGE, HOT PINK, LIGHT PINK, PURPLE, SKY BLUE, BLACK, HUNTER, LIGHT LIME, RED, YELLOW. Product Size: 660Wx406H mm. Print/Embroidery. Size: 381Wx304H mm (Print). 600gsm 100% cotton terry. Company or event logo can be custom woven directly into the loops of the jacquard terry golf/bar mop towel using up to three colours. Custom woven jacquard towels are available in bar mop, standard golf, and caddy sizes. BLACK, WHITE, AQUA 3125, BRONZE 730, BURGUNDY 209, CHAMPAGNE 466, COPPER 1525, CREAM 4545, CURRANT 195, DARK GREEN 3435, DARK LIME 362, DARK ORANGE 167, DARK RED 202, EARTH 451, EGGPLANT 2767, ESPRESSO 411, FRENCH BLUE 285, GARNET 187, GOLD 123, HUNTER GREEN 357, KELLY GREEN 3298, LIGHT BLUE 283, LIGHT LIME 375, LIGHT ORANGE 1575, LIGHT PINK 203, LIGHT PURPLE 265, NAVY BLUE 289, NEW GOLD 1245, OCEAN BLUE 304, OLD GOLD 143, ORANGE 21, PINK 238, PRAIRIE GREEN 577, PROCESS BLUE 3005, PURPLE 266, RED 185, RUSTY 1535, SCOUR, SILVER 427, SLATE 648, ROYAL BLUE 287, SOFT PINK 1895, TAN 465, TAUPE 1545, TEAL 325, YELLOW 12, SAMPLE (RANDOM COLOUR ONLY AVAILABLE). Product Size: 406x279 mm. Woven up to 3 colours. 260gsm 55% microfibre polyester 45% polyethylene. This innovative microfibre golf towel has scrubber loops on the back side to clean club head of golf ball. Front side is soft absorbent microfibre that can be embroldered with company or event logo or edge to edge sublimation printed. Either a corner hook and grommet or a trifold hook and grommet available. WHITE BASE. Product Size: 635Wx406H mm. Sublimation/Embroidery. Size: 635Wx406H mm (Sublimation). 360gsm, 100% cotton terry velour. Great after shower coverup. Fibre reactive printed in a stylish zebra print. Adjustable velcro closure. Elasticised to provide secure fit. Zebra. Product Size: 710mm length, One Size. Embroidery. Size: Maximum: 254Hx254W mm. 360gsm, 100% cotton terry velour. Great after shower coverup. Fibre reactive printed in a hip leopard print. Adjustable velcro closure. Elasticised to provide secure fit. Leopard. Product Size: 710mm length, One Size. Embroidery. Size: Maximum: 254Hx254W mm. 360gsm, 100% cotton terry velour. Great after shower coverup. Fibre reactive printed in various vibrant polka dot colours. Adjustable velcro closure. Elasticised to provide secure fit. Aqua/White, Black/White, Fuchsia/White, Purple/White. Product Size: 710mm length, One Size. Embroidery. Size: Maximum: 254Hx254W mm. 400gsm, 100% cotton terry velour. Great after shower coverup. Adjustable velcro closure. Elasticised to provide secure fit. Flattering above knee length, multi-needle stitching. White, Black, Navy, Pink, Purple, Red, Hot Pink. Product Size: 736mm length, One Size. Embroidery. Size: Maximum: 254Hx254W mm. 150gsm, 60% cotton / 40% polyester terry. Light weight kimono robe with cotton terry loops on the inside. Great for travel, mid-calf length. 3/4 length sleeves. 2 patch pockets and double belt loops, self-belt. White. Product Size: 1219mm length, One Size. Embroidery. Size: 102Hx102W mm. 280 gsm, 100% microfibre polyester fleece. Most luxurious fleece robe offered in the industry. Elegant shawl collar. Mid-calf length. 2 patch pockets and self-belt. Beige, Black, Burgundy, Chocolate, Navy, Light Pink, Purple. Product Size: 1219mm length, One Size. Embroidery. Size: 102Hx102W mm. 240gsm 100% microfibre polyester. This super soft microfibre velour sports towel is great for edge to edge sublimation printing of company or event logos. Triple sheared on both sides to eliminate scratchy feel inherent to microfibre towels. Four colour process images printed with brilliant colours. SUBLIMATION. Product Size: 305Wx203H mm. Sublimation. Size: 305Wx203H mm (Sublimation). 240gsm 100% microfibre polyester. This super soft microfibre velour sports towel is great for edge to edge sublimation printing of company or event logos. Triple sheared on both sides to eliminate scratchy feel inherent to microfibre towels. Four colour process images printed with brilliant colours. SUBLIMATION. Product Size: 457Wx279H mm. Sublimation. 279x457 mm (Sublimation). 240gsm 100% microfibre polyester. This super soft microfibre velour bar mop towel is great for edge to edge sublimation printing of company or event logos. Triple sheared on both sides to eliminate scratchy feel inherent to microfibre towels. Four colour process images printed with brilliant colours. SUBLIMATION. Product Size: 559Wx381H mm. Sublimation. Size: 559Wx381H mm (Sublimation).